Knowing that Andy would immediately put the top back on our convertible as we headed down I-95 for an hour drive, I needed a sturdy hair 'do. 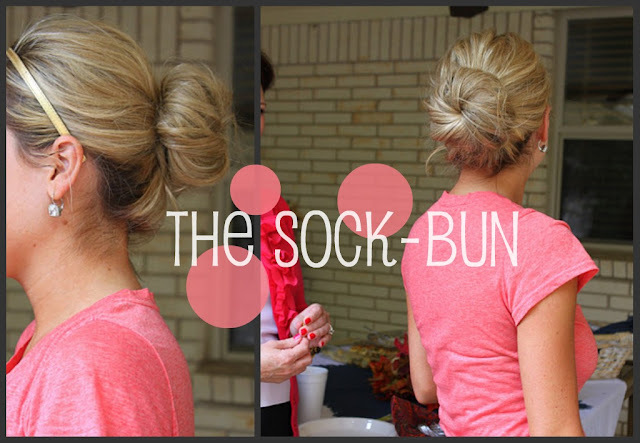 Enter the sock-bun. It's a remarkable thing that can turn a puny ponytail into a full and glamorous bun! Click on the picture above to go to the tutorial on Three Pink Dots where I learned to do the sock-bun (photos by Sarah Baker Photography). If it doesn't work for you the first time, just try again. I tried a few times, quitting halfway through the process thinking "this isn't going to work" but if you just keep rolling, eventually it does with no bobby pins needed!